Minke whales are widely distributed throughout tropical, temperate and polar regions. The smallest, and most streamlined of the rorqual whales, they are built for speed. Their scientific name acutorostrata refers to the acutely pointed and streamlined shape of their head. There are two recognized species of minke whales with partially overlapping ranges: The Common minke whale (Balaenoptera acutorostrata), and the Antarctic minke whale (B. bonaerensis)1. Dwarf minke whales are an unnamed subspecies of the common minke whale that occurs almost exclusively in the Southern Hemisphere. In addition the North Atlantic and North Pacific common minke whales also have separate sub-species designations (B. a. acutorostrata in the North Atlantic and B. a. scammoni in the North Pacific). Minke whales are not known for their acrobatic or curious behavior around vessels, but their widespread and predominantly coastal distribution make them one of the targets of whale-watching activities around the world. Dwarf minke whale on the Great Barrier Reef. Photo courtesy of Matt Curnock, Minke Whale Project. From a distance minke whales could be confused with other rorqual whales like fin, sei or Bryde’s whales. But once seen at close range the smaller size, taller dorsal fin placed closer to the head, and distinctive white flipper stripes make them easy to distinguish. 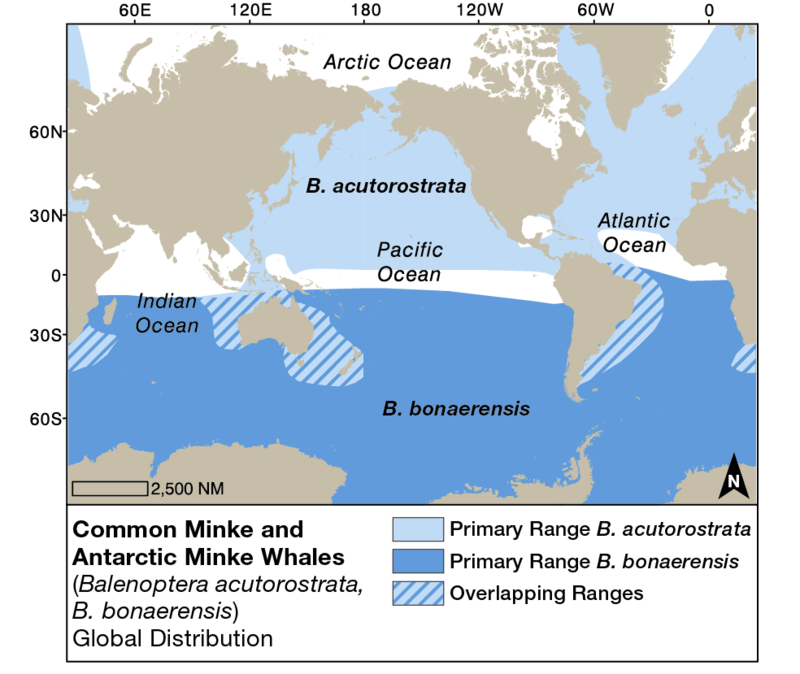 Minke whales are widely distributed through most tropical, temperate and polar regions2 from approximately 65°S to 80°N3. Common minke whales are found in all ocean basins, with the dwarf minke whale subspecies more or less limited to the Southern Hemisphere. 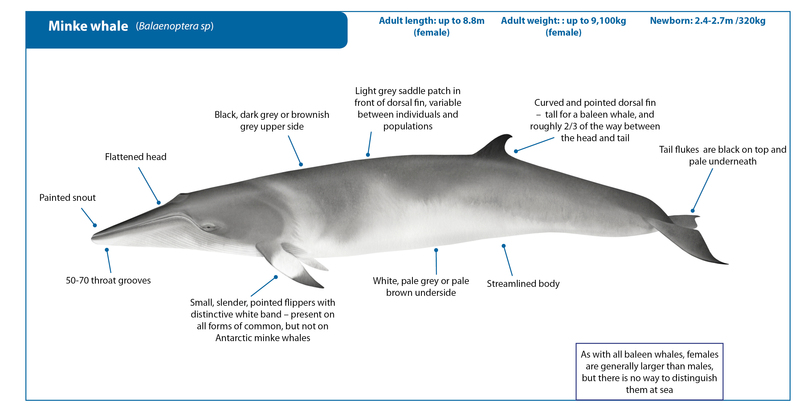 Antarctic minke whales generally occur between 60 degrees South and the ice edge, although they can also occur inside the pack ice, making them difficult to study4. Minke whale in the Gulf of Maine. Photo courtesy of Whale and Dolphin Conservation USA. 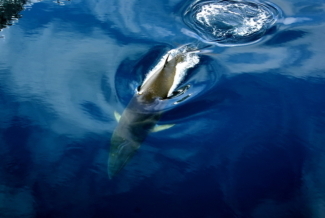 Common minke whales have varied diets, with many populations feeding on a vairety of small schooling fish ranging from anchovies to mackerel, herring, capeline and cod. Some populations are also known to eat plankton, and krill is an important prey species for common minke whales off of Greenland. Antarctic minke whales rely almost exclusively on krill – as do so many other species of blaeen whale that feed in Antarcitc waters2. 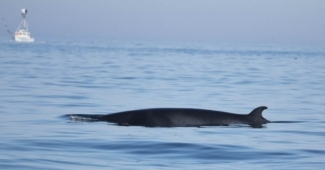 Minke whale seasonal movements are less predictable and less well defined than many other species of baleen whales that have a very clear seasonal migratin pattern between summer feeding grounds and winter breeding grounds. Although there may be some seasonal movement in some pouplations, breeding can occur year-round, and calves are born roughly 10 months after conception. Calves remain with their mothers for 5-6 months, and females reach the age of reproduction at 7-8 years. Female minke whales appear to be able to give birth to one calf every year, unlike many other baleen whales that produce only one calf every 2-3 years2,5. Minke whale in Antarctica. Photo courtesy of Fabian Ritter. Killer whales are the only known natural predator of minke whales. In fact, minke whales may form a major component of the diet of some forms of killer whales in the Antarctic2. Considered too small and too fast to be worth hunting, minke whales were overlooked by most whalers throughout the 19th and 20th centuries, and only became the focus of intensive whaling efforts when most other species were severely depleted and difficult to locate. As such, most minke whale populations were less severely affected by whaling than other species2. Today however, they are one of the few species of whale to still be hunted in significant numbers in countries that have lodged objections to the current IWC moratorium on whaling, such as Iceland and Norway, and by the Japanese who conduct scientific whaling programmes in the Antarctic and North Pacific. 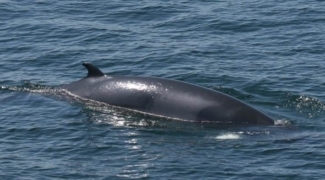 Common minke whales are difficult to assess globally due their diffuse distribution. However, they are designated as Least Concern under the IUCN Red List for threatened species, due primarily to the fact that they were less depleted by commercial whaling than other baleen whale species. Some populations are subject to annual hunts which are deemed to be sustainable by the countries that implement the hunts (Iceland, Norway, and Japan). Antarctic minke whales are considered Data Deficient under the IUCN Redlist. Currently they appear to number over 500,0003,15. Analyses revealed that their numbers increased from 1930 until the mid-1970s, declined over the period from the mid-1970s until about 1988, and then remained more or less stable over the past 20 years11 6. In other words, the abundance estimated during the 1991/92 – 2003/04 southern hemisphere summer seasons was about 30% lower than that estimated during the 1985/86-1990/91 southern summer seasons15. .3 The reasons for this have not fully been explained. 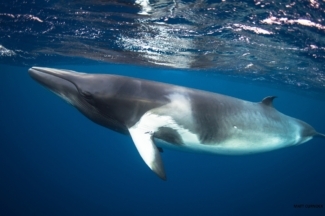 Antarctic minke whales are listed under Appendix II on the convention on Migratory Species (CMS). The eastern North Atlantic as well as the eastern north Pacific subspecies are included in Appendix II of CMS. Minke whale in the Gulf of Maine with fishing boat in the background. Photo courtesy of Whale and Dolphin Conservation, USA. Studies have shown that (whale watch tourism) vessels can distract minke whales from important feeding opportunities13. As with all other species, the responsible management of the number of vessels/tours, and respecting the approach distances and approach methods that are allowed through clear regulations and enforcement is of the utmost importance to not only enjoy these animals but also ensure they stay safe and healthy. Snorkelers with dwarf minke whale on the Great Barrier Reef. Photo courtesy of Matt Curnock, Minke whale Project. Perrin, W. F. & Brownell Jr, R. L. Minke whales Balaenoptera acutorostrata and B. bonaerensis in Encyclopedia of Marine Mammals (eds W. Perrin, B. Wursig, & J.G.M. Thewissen) 733-735 (Elsevier, 2009). Reilly, S. B. et al. Balaenoptera acutorostrata in I IUCN Red List of Threatened Species (http://www.iucnredlist.org/det... Downloaded on 9 October 2017, 2008). Williams, R. et al. Counting whales in a challenging, changing environment. Scientific reports 4 (2014). Knowlton, A. R. et al. Effects of fishing rope strength on the severity of large whale entanglements. Conservation Biology, n/a-n/a, doi:10.1111/cobi.12590 (2015). Van Waerebeek, K. et al. Spatial and temporal distribution of the minke whale, Balaenoptera acutorostrata (Lacécepède, 1804), in the southern northeast Atlantic Ocean and the Mediterranean Sea, with reference to stock identity. Journal of Cetacean Research and Management 1, 223-237 (1999). Aono, S., Tanabe, S., Fujise, Y., Kato, H. & Tatsukawa, R. Persistent organochlorines in minke whale (Balaenoptera acutorostrata) and their prey species from the Antarctic and the North Pacific. Environmental Pollution 98, 81-89, doi:https://doi.org/10.1016/S0269-... (1997). Kleivane, L. & Skaare, J. U. Organochlorine contaminants in northeast Atlantic minke whales (Balaenoptera acutorostrata). Environmental Pollution 101, 231-239, doi:https://doi.org/10.1016/S0269-... (1998). Moon, H.-B. et al. Chlorinated and brominated contaminants including PCBs and PBDEs in minke whales and common dolphins from Korean coastal waters. Journal of Hazardous Materials 179, 735-741, doi:https://doi.org/10.1016/j.jhaz... (2010). Punt, A. E., Bando, T., Hakamada, T. & Kishiro, T. Assessment of Antarctic minke whales using Statistical Catch-at-age Analysis. Journal of Cetacean Research and Management 14, 93-116 (2014). Parsons, E. From whaling to whale watching: a history of cetaceans in Scotland. Glasgow Naturalist 25, 53-57 (2012). Williams, R. & Thomas, L. Distribution and abundance of marine mammals in the coastal waters of British Columbia, Canada. Journal of Cetacean Research and Management 9, 15-28 (2007). Birtles, R., Arnold, P. & Dunstan, A. 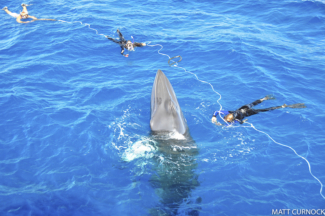 Commercial swim programs with dwarf minke whales on the northern Great Barrier Reef, Australia: some characteristics of the encounters with management implications. Australian Mammalogy 24, 23-38 (2002).